What other car can this be but a Porsche? Every classic car enthusiast recognizes the origins of the Porsche brand and this car speaks volumes.The 356 actually began production in Gmünd, Austria where 50 cars were built. The factory was then relocated to Zuffenhausen, Germany, where production continued until it ceased in April, 1965. The cars produced in Gmünd were made from handcrafted aluminum. Once production moved to Germany, steel was used. The early aluminum-bodied cars are commonly referred to as "prototypes." An interesting snippet in the history of Porsche is who manufactured the steel bodies. Porsche contracted with Reutter to build the bodies, eventually buying the company in 1963. Reutter kept making seats for Porsche, changing their name to Recaro. What some enthusiasts may not know is that Porsche kept the 356 in production for two years after its replacement, the 911, was introduced in 1963. Since the 356 proved to be such a resounding success among both sports car and racing enthusiasts, we can only guess it was probably difficult for Porsche to bring a great thing to an end. But they did and a classic collectable was born. A Classic is Born Ferry Porsche knew what made the 356 special and treasured by Porsche fans. He spoke about it in the September, 1972, issue of Panorama, the PCA magazine. “….I had always driven very speedy cars. I had an Alfa Romeo, also a BMW and others. ….By the end of the war I had a Volkswagen Cabriolet with a supercharged engine and that was the basic idea. I saw that if you had enough power in a small car it is nicer to drive than if you have a big car which is also overpowered. And it is more fun. On this basic idea we started the first Porsche prototype. To make the car lighter, to have an engine with more horsepower…that was the first two seater that we built in Carinthia (Gmünd)”. Porsche 356 Production History There are three distinct model lines during production of the 356, known simply as the 356 A, 356 B and 356 C.
The 356 A began life in 1955, with the internal designation of "Type 1." A second version of the 356 A was introduced in early 1957 and was known as the "Type 2." The "Carrera" or four-cam engine became an option with the 356 A following its sole use in the spyder race cars. Late 1959 saw the birth of the 356 B with notable styling changes and is known as the T5. In mid-1962 the 356 B became the T6 and is known for its twin grills on the engine lid, an external fuel cap on the right front fender and larger rear window. The 356 C was introduced in 1964 with the largest performance improvement being disc brakes at all four wheels. Porsche also offered a more powerful 95 hp SC engine. Even though the 911 was on sale, the 356 C was still in demand and sold in North America until 1965. Interestingly enough, the last ten 356s were produced for the Dutch police force in 1966 as 1965 models. 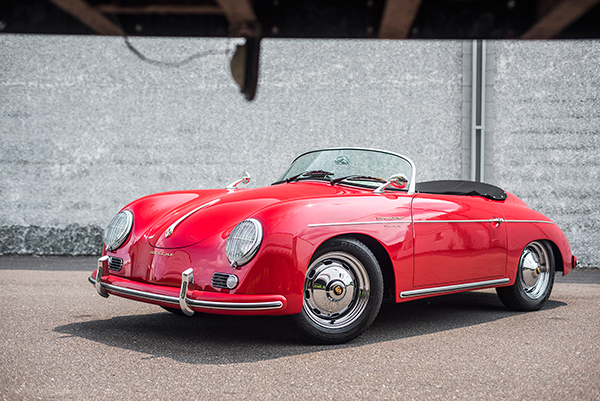 If you are a Porsche enthusiast and in the Minneapolis area, take advantage of what Vinty has to offer by checking out the 1957 Porsche 356 Speedster tribute car pictured above. Spring is here, isn't it? Hello, Everyone! We hope your Winter is going well for all of you. We have several exciting updates for you this month. Here we go: Classic car owner? We would love to list your car on Vinty! While we are working on finding insurance for self-driven rental, we are getting more and more requests for photoshoots or chauffeuring rentals. If you have a classic car that you think would be a good fit for Vinty, get in touch with us! For chauffeuring and photoshoots rentals, you (the car owner) will be in control. You set the rental price; you drive the car, etc. We hope this will become a great way for classic car owners to maintain their vehicle in road worthy conditions and keep an essential part of the American motoring history thriving! Palm Springs, Santa Barbara & Seattle: Vinty is alway adding cars and locations! We opened three new locations last month, Vinty is now in 13 locations, nationwide. We are now able to offer you chauffeured rides in Santa Barbara, Palm Springs, and Seattle. Great car stories on the Vinty blog! We love to share car stories with you. Did you read about our event for the French luxury brand, Yves Saint Laurent or our recap of the Arizona auction week? You can check our latest stories atdrivevinty.com/blog. Do you have a story you want to share? Contact us and we would glad to submit your article to our editorial team. Remember, Vinty Gift Cards are available for Valentine too! What other gift do you need when you can offer to your loved one a unique driving experience? Head over to gift.drivevinty.com and send the ultimate Valentine present. What’s next? We are working hard to expand our inventory and open new areas to help people get behind the wheel of their dream car. As always, if you want to contact us, feel free to send us an email at [email protected], we look forward to hearing from you! The Holiday season is here! We hope you are going to spend some quality time with your family and loved ones. We have several excellent updates for you this month. Here we go: Vinty Gift Cards are available! What other gift do you need when you can offer to your loved one a unique driving experience? Head over to gift.drivevinty.com and send the ultimate Christmas present. Hawaii, Detroit, Boston: Vinty is alway adding cars and locations! You probably noticed, but we opened three new locations last month. We are now able to offer you a great driving sensation in Hawaii (Aloha! ), Detroit (Motown!) and Boston (Beantown!).
. We want you to experience the thrill of a classic car even when you are on vacation, this is why we are proud to add this muscle car in Maui. 1963 Rolls-Royce Silver Cloud. Celebrate your wedding in style in Motor City with this beautiful English limousine. The legendary 1957 Porsche Speedster. The mythical 1965 Ford Mustang Fastback. Introducing the Vinty blog! We love to share car stories with you. We started writing about it on the Vinty blog. You can check it out at drivevinty.com/blog. Do you have a story you want to share? Contact us and we would glad to submit your article to our editorial team. What’s next? We are still working hard to expand our inventory and open new areas to help people get behind the wheel of their dream car. As always, if you want to contact us, feel free to send us an email at [email protected], we look forward to hearing from you! Many classic cars have an interesting history and the Cadillac Eldorado is no exception.It begins with a small controversy and a competition. Contrary to what was reported by Palm Springs Life magazine at the time, the Cadillac Eldorado was not named after the Eldorado Country Club in Indian Wells, California. With a little research, anyone at the time would have discovered that the country club didn’t open until 1957, five years after Cadillac held the naming competition that gave birth to the Eldorado name. Apparently the country club was a favorite haunt for General Motors executives. Unfortunately, the magazine took too many liberties and assumed too much. And became a humorous side note in the car’s history. The Eldorado CompetitionThe Cadillac Eldorado name was actually coined following an internal naming competition for an upcoming concept car in 1952. The concept’s inception came about as a tribute to Cadillac’s golden anniversary. The concept led to a limited-edition convertible introduced in 1953. The winner of the naming competition was a secretary in Cadillac’s merchandising department, Mary-Ann Marini. Ms. Marini, using two Spanish words, created a contraction that translates as “the gilded” or golden one. El Dorado also refers to the South American “Lost City of Gold”, long searched for by Spanish explorers. And so began the story of the Cadillac Eldorado. History and StylingOne of the classic Eldorado's offered by Vinty and featured in the photography here is a 1976 model. The body style of the 1976 model originated in 1971 as the seventh generation in the car’s lineup, with Cadillac selling 27,368 cars after the new body style was introduced. The following year, Cadillac sold a little over 40,000 Eldorado’s. Subsequently, Cadillac went on to make facelifts to the Eldorado in 1973 and 1975. Remarkably enough, a 1973 Eldorado was chosen as the pace car for the Indy 500. Whether it was the facelift or the car’s appearance at Indianapolis, sales soared to 51,451, equaling over one-sixth of all Cadillac sales. As you look at the 1975 Eldorado, styling updates for that model year were rectangular headlights, rear wheel openings minus the fender skirts and crisper body lines. These may seem like minor updates but it made for a more visually appealing car which some say carried design cues reminiscent of the 1967 through 1970 models. Vinty’s Eldorado isn’t an Indy 500 pace car but it is available for rent in Los Angeles. Check it out and get your reservation in now. Vinty on Product Hunt — Vote for us! Over the weekend, we have been featured on Product Hunt, a website that lets users share and discover new products. If you have a minute this week, please consider voting for us at https://www.producthunt.com/tech/vinty. New locations, new cars! You probably noticed, but we opened two new locations last month. We are now able to offer you a great driving sensation in Rhode Island and Minnesota. Some of our team’s favorites include: 1987 Porsche 911 Carrera. As a personal fan (and previous owner) of the 3.2 Carrera, this is a fantastic addition to the fleet. This beautiful Porsche is available in Minneapolis. 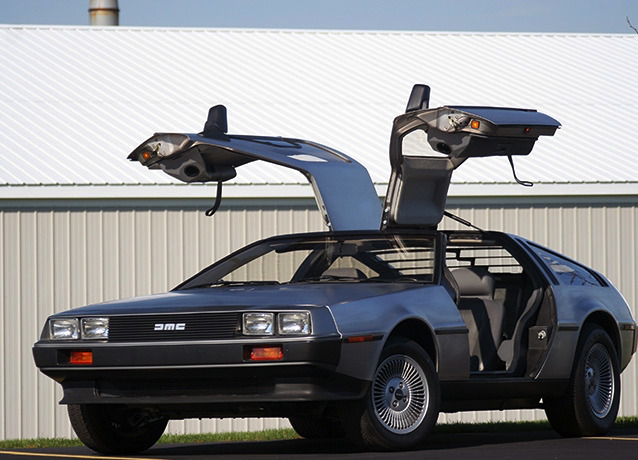 1981 DeLorean DMC-12. Yes! Marty McFly’s car is available in Rhode Island for your photo shoot or event. The gull-wing doors and fiberglass body structure will make an impression; we guarantee it! 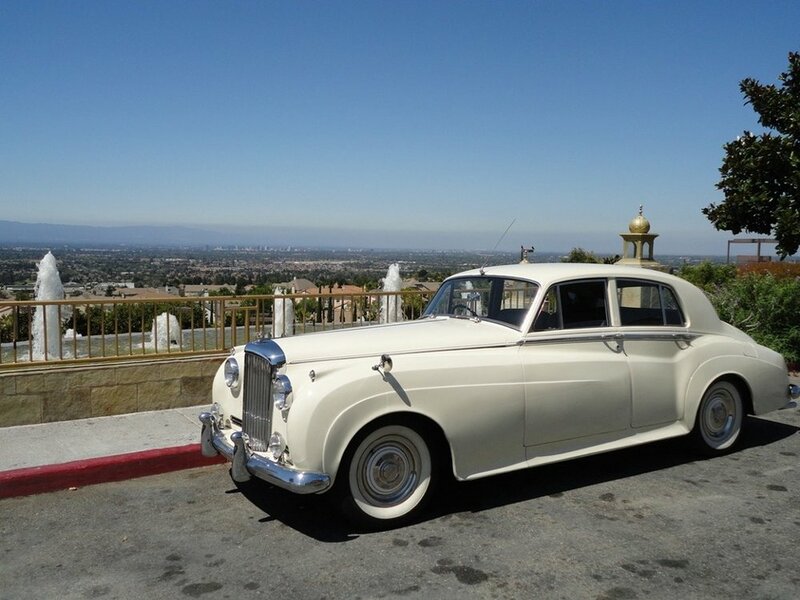 We have also added some beautiful Rolls Royces for your (or your friends’) special day in Las Vegas and San Diego: 1950 Rolls Royce Bentley, available in San Diego and Los Angeles. 1956 Silver Cloud Rolls Royce, available in Las Vegas. Vinty at Pomona Swap Meet this Sunday. The West Coast’s Largest Swap Meet and Classic Car Show, Pomona Swap Meet, is happening this Sunday. Our team will be on site with a booth to present our marketplace to the public. If you plan to come to the show, please pay us a visit! We would love to meet you! Haven’t heard of this event? Petrolicious did an excellent recap last August in this article. What’s next? We are still working hard to expand our inventory and open new areas to help people get behind the wheel of their dream car. California, Nevada, New-York: Vinty is expanding.Already a month since we launched! It has been very exciting and we already booked rentals. Thank you so much to our beloved customers trusting us and choosing us for their special day behind the wheels! What’s next? We are still working on expanding our inventory and opening new areas to help people get behind the wheels of their dream car. Don’t just dream it. Enjoy the Ride! Howdy Vinty community! Today, we are excited to tell you that we are officially accepting registrations and that you are now able to rent a car on Vinty! So go ahead, head over to http://drivevinty.com/ now and request your dream car! Remember that 1965 Mustang convertible you gawked at on the street a few days ago, that 1970 Chevrolet Impala in your favorite movie or that 1979 VW Westfalia Pop-Top Camper you wanted for the road trip you’ve been pushing off… we’ve been working hard to add these and other cars and are excited to finally be able to make them available to you! We love classic cars and sharing the thrill of a unique driving experience is Vinty’s passion. We partner with the best classic car rental companies to make sure that your ride is a memorable experience! We are constantly trying to improve Vinty and would be very happy to get your direct feedback on how we can improve. If your dream car is not on Vinty, just contact us and we will find it for you. What’s next? We are working on expanding our inventory and opening new areas to help people get behind the wheels of their dream car. Greetings from sunny San Diego! Wow, already June! We are working hard on making Vinty the place you will love to find classic car rentals. Let me give you some updates. 1982 Westfalia Vanagon The perfect camping van for your family vacation! 1965 Lincoln Continental 340HP engine to power your luxury drives! 1956 Bentley S1 The luxury limousine for your wedding! Business Model. When I started this adventure, the goal for Vinty was to become the best peer to peer marketplace for classic cars. As of today, we are still working on this goal and finding an insurance product to add personal owners to the platform. The world of insurance is complex and Vinty is trailblazing… We hope to bring personal owners onboard later this year. For our launch, we have partnered with the best professional classic car rental companies in California to bring you the best possible rides available in our beautiful state. We are targeting our launch for the end of this month. We look forward to your feedback and please email me your thoughts or comments directly at [email protected]. Thank you for signing up for Vinty, we are so glad you’re here! Now that you’ve chosen to receive Vinty’s updates, well it’s time to give you some. Pretty much everything is going well: the insurance partner is almost selected, the work on the platform is starting next week and we are up on social medias (see Twitter, Instagram and Facebook accounts). Over the past two months, we have been working on this new venture with great enthusiasm and many of the people we have talked to are excited about the project! we have been attending swap meets and other classic car lover events asking owners for advice (check this album at Ponoma last weekend). We are going to do great things! We will keep you updated on my progress over the next few weeks, if you have any feedback, a question, or something you want to address in the next newsletter, send us an email! We look forward to hearing from you.